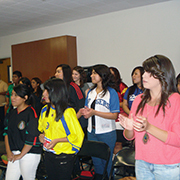 The Friday night young adult gatherings of Jóvenes Adultos “Nueve Generación” typically attract some fifty participants. The group welcomes all single young adults (at least twenty-one years old) from St. Joseph the Worker and other parishes. And no, you don’t need to speak Spanish to come! 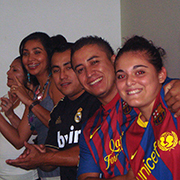 The group exists to help the “new generation” – today’s church – find God in their lives. A typical Friday night meeting begins with a welcome, prayer, and gospel songs of praise and worship. With a different theme each week, the main part of the evening consists of a reflection by a member, a witness talk, a presentation by an invited guest, Bible study and discussion, or other activity that connects faith with life. The Young Adults present “The Passion of Christ” annually on Good Friday. They participate in the Christmas Pastorela (Shepherd’s Play), a dramatic re-creation of the shepherds’ journey to the holy site of the Nativity. The Young Adults help with the Hispanic community food sales on Sundays after Masses and put in long hours at the annual parish Festival, helping in the Hispanic food booth. 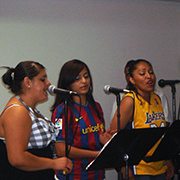 Many members attend the annual Religious Education Congress in Anaheim.